For more than 40 years, the mini-14 has outshined other similar semi-automatics. Ruger’s miniaturized version of the extremely popular M-14 rifle has unparalleled versatility and a rugged appeal that continues to make it a clear option for use on the farm, for SHTF, for hunting, and of course, for taking care of a troublesome varmint. The redesigned version of the mini-14 which has been in production since 2005 is considered to be extremely accurate. 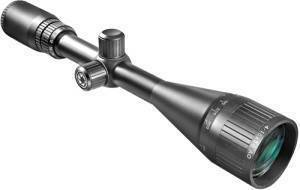 Pair that with a good quality scope, and you are looking at razor-sharp precision for targets between 500-600 yards. But finding the best scope for mini-14 is no simple feat. Because considering the compact size of the rifle with the very specific shooting capabilities, you need a perfectly sized scope that does not add too much weight to it but serves the purpose nevertheless. After a lot of deliberation and speaking to countless proud owners of the mini-14 who have experimented with a lot of different scopes and even tinkered with the design to try out their personal favorite scopes, here’s our list of the best. Nikon’s P-223 3-9x is a very lightweight, compact and accurate scope that can extend the precision of the mini beyond the obvious 600-yard range. With perfect all-weather optical quality, quarter MOA adjustments and variable zoom, you are looking at a very versatile scope at almost half the price of the M-223. The P-223 has a polymer all-weather casing that makes it lighter in weight as compared to an all-metal scope. That takes nothing away from the durability. 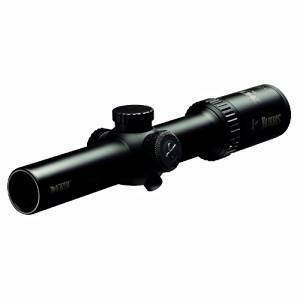 The scope has an all-black matte finish with an uncanny resemblance to a full-fledged tactical one. Nitrogen filled and O-ring sealed, this will keep you good company even on a foggy and rainy day. The BDC 600 reticle that is trajectory-specific offers unbeatable precision while keeping constant eye-relief. Even when you zoom in at 9x, the eye-relief is excellent and offers a comfortable aiming experience. You have hash marks at 100-600 yards with open circle aiming points for good measure. It has a preset to eliminate parallax at 100 yards. There may be some who miss an adjustable parallax. But at this price point, the Nikon P-223 offers a flawless performance. The optical quality is unparalleled, with crisp and clear visuals even in extreme low light. Irrespective of whether you use it for target shooting or hunting varmint, the P-223 comes across as a great choice for the mini-14. Most people using the mini-14 are looking for a scope that offers good visuals and easy adjustability up to 500 yards without costing a fortune. Bushnell’s 3-9 X 40mm riflescope fits the description to the T, making it a very worthy contender for the best scope for mini-14. It boasts of a caliber-specific BDC reticle with multi-coated optics, a very rich feature set for a scope that costs under $150. There is something about mounting an all-metal scope on your rifle that makes it feel more reliable. The Bushnell 3-9x is constructed from aluminum alloy that does not add much weight to your gun but is extremely durable. 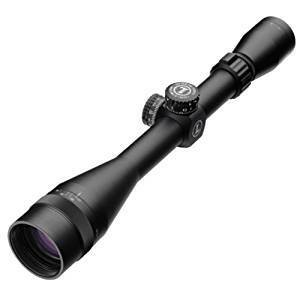 The anodized finish keeps it scratch resistant, and the scope is O-ring sealed to protect the optics. Nitrogen purging will prevent even a trace of moisture from damaging the optics or causing fungus. The 3-9x 40 mm is from Bushnell’s extremely popular AR range of riflescopes that are known for their precision and reliability. On the field, it is fast, accurate and steady. You can zero to 100 yards in the blink of an eye, and there are markers to aim with pinpoint precision for up to 500 yards. The only caveat is that all of Bushnell’s AR series of scopes have an erector cap assembly that does not allow you to mount the scope really low. If you like to mount them really low so that you can look right through the middle when you throw the rifle on your shoulder, the Nikon P-223 may be a better option for you. If medium height mounting works fine, then the Bushnell P-223 is as good a scope as any for the Mini-14. There are very few things that you cannot do with it. The mini-14 offers handiness that is identical to the M1 carbine along with the powerful ballistics of the AR15. This makes it one of the most preferred choices for shooting prairie dogs and other varmints in farms and ranches. 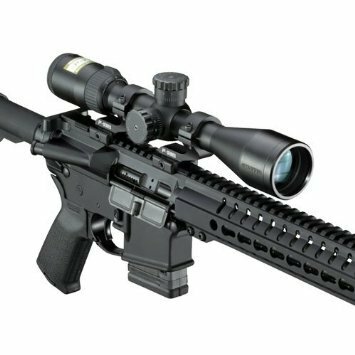 The Barska 6.5-20 x 50 MM AO Varmint Target Dot riflescope is tailormade for such scenarios. This is a budget-priced riflescope that outperforms a lot of much higher priced scopes and offers tremendous value for money. Make no mistake; the Barska Varmint Target riflescope looks massive on the mini-14 with its 16-inch length. But it is surprisingly lightweight and will not add more than 3 lbs. To the gun along with the mount. It has a one-inch, shockproof all-metal casing that is fog-proof and weatherproof. Take it out on the farm on a rainy day, and the Barska performs like a beast. To get a 50 mm objective lens with 6.5-20x magnification at this price point is a steal. And it’s not just thrown in as a marketing gimmick either. The Barska will let in a lot of light making it ideal for dawn or dusk shooting, a time when Varmints are most active. And it provides extremely clear and crisp images thanks to the multicoated optics. The Barska has an easy-access magnification ring that lets you zoom in from 6.5 x to 20x in the blink of an eye. This ease of use is extended to the windage and elevation knobs and the 1/8 MOA adjustments which have a very tactile response. Most riflescopes at this price point and even beyond it offer a preset setting for parallax at 50 or 100 yards. But the Barska boasts of an Adjustable Objective (AO) for parallax correction which significantly improves accuracy while shooting targets. Add the target dot reticle, and you’d have to be really inexperienced with the mini-14 with the Barska mounted on it to miss that prairie dog. Considering the feature bundle and the price tag, a lot of people expect the optics to be a tradeoff. Not one bit. You can use the Barska for a clear field of view and uninterrupted visuals even if you are blinded by the glare. This will give you a crisp and bright view at all times of the day. Backed by Barska’s limited lifetime warranty, this gives you more bang for your buck than any other riflescope at this price point. The only let down in this otherwise complete package is that the magnification starts to suffer beyond 18x and is pretty ordinary at 20x. If you were to analyze the features, then the Crosman 2-7x32mm from Centerpoint could easily pass for a much higher priced scope. Instead, you are greeted by the best scope in its price range. This is hands down the most feature-rich budget-priced scope in this list. This is compact and versatile scope for the mini-14 that features a dual-illuminated reticle making it a great choice for hunting, plinking or even target practice for up to 500 yards or more. The Crosman CenterPoint 2-7x riflescope has an all-metal, nitrogen purged and O-ring sealed, single tube design that can sustain extreme weather conditions. It is lightweight, extremely durable, and can hold zero, even on a rifle with serious recoil. When mounted on the mini-14, the CenterPoint Adventure Class stays rock steady and extends your precision beyond the iron sight range. The 32 mm objective lens is not the largest you can have for light transmission. But Crosman more than make up for it with a good quality multi-coated lens that gives you bright and crisp images even in extremely low light. And there is the illuminated red and green reticle mil-dot that has varying levels of adjustment according to the light. This extends the utility of your mini-14 from a varmint hunting rifle to a bush hunting rifle for small sized game. The variable zoom is not the best. But when combined with the adjustable objective, it is perfect to give you a parallax-free visual for up to 100 yards. At max zoom, the image does not distort, and you can easily find the sweet spot to within an inch of your target. Turrets are finger adjustable and have a ¼ MOA for every 100 yards. They have a tactile response to the click allowing you to count them if you are a beginner. The package includes a couple of Weaver-style Rings which allows you to mount it at medium height. For anything lower, you might need another set of mounting rings. The Crossman Adventure Class 2-7×32 has enough features to make this your grab and go scope for the mini-14. Irrespective of whether you are looking to bring down varmint or an injured farm animal, this will give you the range and the precision you desire from your mini-14. When you demand 100% American-made reliability to go with your Mini-14, then don’t cut corners or pinch pennies. 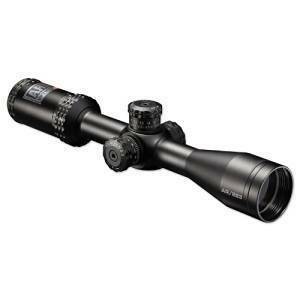 Go with the Leupold 115394 Mark AR riflescope. This is the most reliable scope for the mini-14 in this list. It is perfect for medium to long range shooting and features a Mil Dot reticle that uses the second focal plane. Everything from the construction to the precision screams quality, and it is impossible to make even one wrong shot with this scope. To allow you to hunt in low-light conditions, the lens is coated with Leupold’s index-matched coatings that enhance the transmission of light. To compensate for shooting in bright sunlight or when staring at a target against the sun, the blackened lens edges reduce glare giving you a clear visual. You will never miss a target due to ballistic drop with the Leupold Mark AR. It features 1/10 mil impact point correction which ensures precision even at extended ranges. The 6-18x variable magnification clubbed with finger-operated tactical turrets allow you to consider this for competitions at 1000 yards. It may not be your best choice for this scenario, but at the price point, you will be hard-pressed to find anything better. 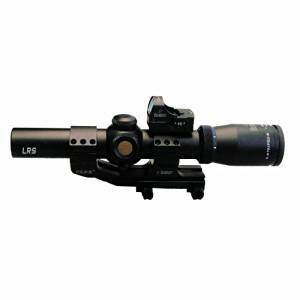 Leupold makes some of the best riflescopes in the industry. And the 115394 Mark AR is their entry level offering. But it is the best scope for mini-14 that you can buy for the price. It is lightweight, easy to adjust, immaculately precise and extends the capabilities of the mini-14 beyond the 600-yard range.